Another spirited fightback helped DUFC to a superb win over UCD – as well as keeping them in the top tier of Irish rugby for another year. At the end, when all was said and done, Tony Smeeth stood still a moment in his usual position behind the goalposts of College Park, head bowed, a quiet smile on his face. Then, suddenly, he was out in the fray, shaking hands, slapping backs, as all around his players celebrated a superb Colours win over University College Dublin (UCD). Dublin University Football Club (DUFC) certainly know how to make life difficult for themselves, but then, it appears, that’s the point. It’s almost as if they enjoy the challenge of the comeback, of defying the odds time and again, and they demonstrated that yet again tonight with a marvelous second-half fightback. If few could say, at the final whistle, that DUFC weren’t deserving winners, it had not always looked this way. 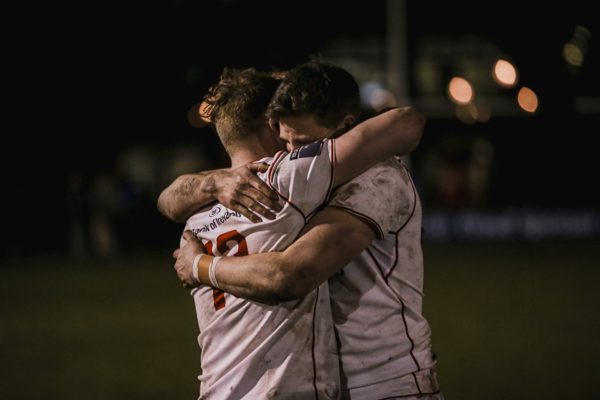 “We really struggled early on, we were very nervous”, Smeeth told The University Times after the game, before being enveloped by an elated Paddy Finlay. He was correct. The game was not yet five-minutes old when UCD cantered in for the evening’s first try. After some good handling in the middle of the park, back-row Jamie Glynn showed great pace to burst through a painfully large gap in the Trinity defence, drawing Jack McDermott before releasing Patrick Patterson with the simplest of passes. So far, then, not so good. Harry Byrne added the extras. An early shock, not fatal, but not good either. Ball retention was essential as DUFC sought to weather the storm. They couldn’t do it. Time and again UCD robbed the ball at the ruck, Trinity at once nervous and sluggish. Angus Lloyd rushed a penalty in a fruitless attempt to gain 10 yards, Michael Courtney was pinged for crossing. The hosts, it seemed, had yet to wake up, and it wasn’t long before Byrne was adding a further three points from the 10-metre line. DUFC needed to front up, to start matching their visitors at breakdown, scrum and lineout. The latter was an area of particular concern, with Finlay struggling to find a white shirt for much of the first half. A whistle-happy referee was not helping, but Trinity were struggling to make any impression on the game. Another Byrne penalty floated narrowly wide, much to the relief of the masses assembled on either side of the pitch. DUFC weren’t the only ones with a high penalty count, though, and it was from set pieces that they belatedly began to construct some phase play. Consistent offsides from UCD gave McDermott, in at fullback for the day, a first shot at the posts. He made no mistake. This, it seemed, was the catalyst. From that moment on DUFC began to play the rugby they have shown so often this season. A gloriously-timed offload from Kyle Dixon set up another dangerous attack, scrambled clear by a UCD defence by now surely dying for the half-time whistle. If the first half had been marked by the slowness of DUFC’s start, the second saw the hosts shoot out of the blocks with startling speed. Finlay, suddenly playing like a man possessed, showed that deceptive pace of his to half storm, half stagger into UCD territory right from the kickoff. As DUFC grew in confidence, so UCD appeared to shrink. Suddenly the ball was all Trinity’s, hampered but not halted by infringements of the sort that saw Jeremy Loughman sent to the bin. He would later be joined by fellow prop Jeremy Loughman, but by then Trinity had clawed the deficit back to four points, McDermott kicking another penalty after a transgression in the lineout. It was just reward for a second half thus far totally at odds with the first, but still UCD led, DUFC frustrated by an inability to turn territory into tries. It seemed inevitable, though, that the hosts would cross the whitewash, and sooner rather than later. Fittingly, it was Courtney who got it. DUFC’s captain had spoken this week about how his twin goals for the year were the avoidance of relegation and a victory in Colours, and he guaranteed both midway through the second half. Patience was required for its creation. Finlay led with a strong carry from his own lineout, before pressure built along with phases as Trinity set up camp. Lloyd eventually released outhalf Tommy Whittle, back in the side after persistent knee troubles, and his lightning-fast hot-potato handling freed Courtney to loop around a lunging Kilgallen and give Trinity the lead. McDermott’s conversion drifted wide. DUFC were monopolising the ball, the life seemingly sucked out of the visitors. However, DUFC were given a timely reminder of the precariousness of their one-point lead when the busy Kilgallen broke against the run of play. The ensuing penalty would have restored the UCD’s lead, but Byrne missed the target, and College Park could breathe again. From this point, it was all about Trinity’s game management. Ensconced in UCD’s 22, with Whittle directing operations, they battered the defensive line, pushing for points while remaining cognizant of the danger of taking unnecessary risks in the pursuit of tries. A scrum offered brief hope of a UCD comeback, but Conall Doherty was pushed into touch. Less than a minute later, and after trojan work from substitute Joe Byrne, DUFC were celebrating both their league survival and a magnificent Colours win. Not a bad evening’s work.